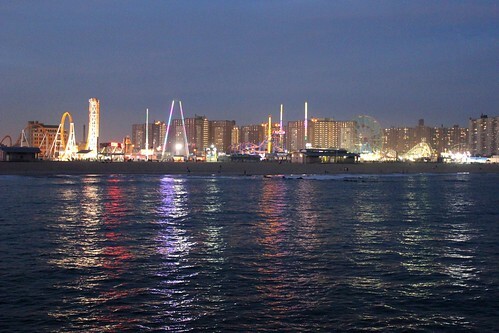 A couple weekends ago, my friend Michelle and I took a trip to Coney Island for one last hurrah before we accepted the sad truth that summer is over. It was a really grey, hazy day in the morning. 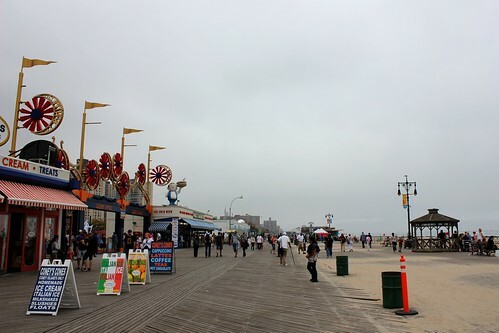 But we enjoyed being able to walk along the boardwalk and explore the amusement park area without huge crowds. 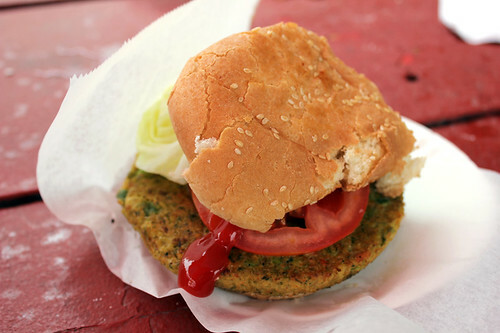 Not wanting to subsist only on cotton candy and deep-fried oreos (as delicious as those indulgences are), we were pleasantly surprised to find one of the fast-food vendors serving veggie burgers along with the usual plethora of meat options. 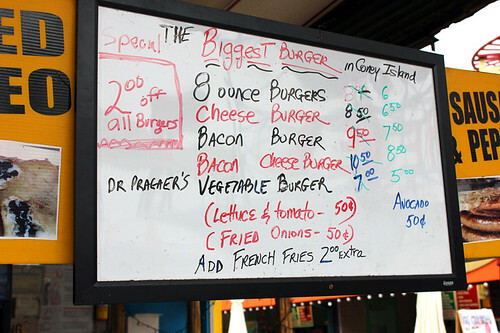 The menu indicated that the veggie burgers were Dr. Praegers veggie patties, but did not specify which flavor (looking at the Dr. Praegers website, it appears that some flavors are vegan while others are not). The cook did not know if the bun was vegan either. Although my expectations for this burger were pretty low to begin with (finding good vegetarian food at Coney Island was something I remembered not being easy in the past), it was still a disappointing sight to see, even as hungry as Michelle and I were. The bun was too small for the patty, and really crumbly (stale? ), and made the whole thing hard to eat. That sad piece of iceberg lettuce you can see peeking out behind the burger was just as depressing as it looks. The tomato was just “okay”. And the patty itself was rather bland. I’ve never been a fan of Dr. Praegers, and this patty did not change my mind (although it looks like they have some new flavors that I haven’t seen before, so maybe I need to give them a second chance). Even with a generous squirt of ketchup, my burger was pretty boring. As fuel to keep us going for an afternoon of amusement park rides, it worked – but it was not a particularly enjoyable meal. While it’s of course heartening to see that at least one food vendor at Coney Island offers a vegetarian option beyond cheese pizza (even the taco stand we found didn’t have a veggie option! ), it’s disappointing that there aren’t more of these options (and better quality ones). 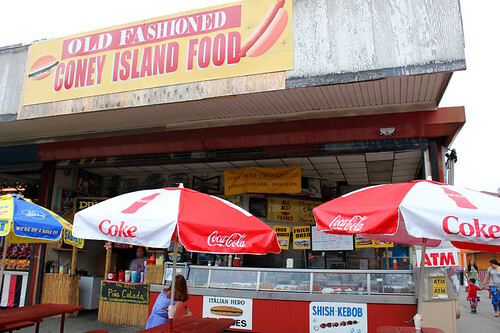 Part of the wonder of Coney Island is how most of it feels stuck in the past – but it would be nice if the food at least would keep up with modern dietary needs so that vegetarian and vegan visitors don’t have to worry about what they will find to eat. the food stand where we found these veggie burgers was behind the sideshow, before Luna Park. 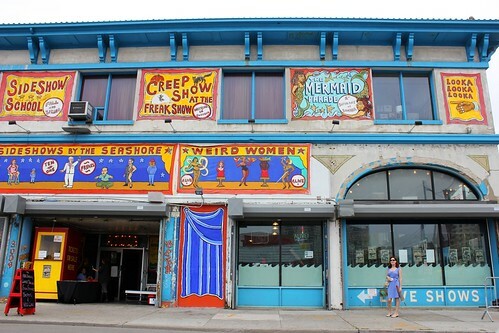 Luckily, the rest of our day at Coney Island was not ruined by the disappointing burger! The sun came out in the afternoon, we had a great time, and stayed until the park closed after dark. 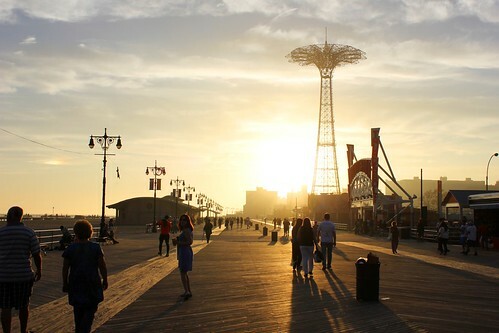 If you haven't been to Coney Island before - you should definitely go next summer! Just bring a bagged lunch with you. You're not missing anything, all dr praeger patties have the same mooshy texture. Actually very popular with toddlers. I don't think i could ever bring myself to pay $7 for one...!